In Montenegro the decline in output was quite marked: about 6% in 2009. In 2010 the economy did not recover all that much. 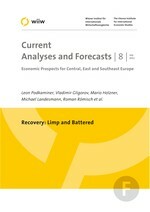 GDP growth will pick up speed somewhat in 2011, increasing to 2%. It is expected that the EU will set a date for the start of negotiations on accession: possibly December this year. That will be of benefit to the financial markets, as the state is borrowing in commercial markets. It will also mean increased transfers from EU funds.